Dimensions of Unit (inches): 8.66" x 2.68" x 2.91"
Shipping Dimensions (inches): 10.04" x 4.53" x 5.12"
Samson's AirLine 88 AG8 Guitar system offers true wireless freedom without the hassle of a beltpack or cable. Featuring a plug-in transmitter with a dual-position connector that is designed to fit a variety of guitar jacks, this frequency-agile UHF wireless system provides high definition sound, premium reliability and a 300' operating range for guitars, basses and other stringed instruments. AirLine 88 AG8 Guitar System. Frequency agile UHF wireless system. 16 operating channels across 24MHz bandwidth. Up to eight simultaneous systems per frequency band (region dependent). Rackmount kit included. CR88 Wireless Receiver. 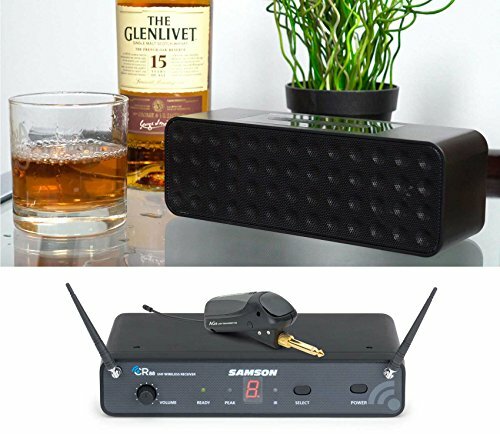 IR sync wirelessly matches receiver and transmitter frequency. True Diversity design minimizes dropouts. Tone key prevents unwanted noise when transmitter is off/out of range. Rockville RPB20B 30 Watt Portable/Home Bluetooth Speaker with SD/Aux in Black. 30 watts peak power. 1010 watts continuous RMS. Battery charges with included USB cable. 3.7V / 2000 mAH battery supports 10 hours of playback at 70 % volume. Charge time: 2.5 Hours. Professional voice conformations. Extremely loud and powerful with industry-leading bass! Bluetooth version. 2.1 with EDR (enhanced data rate).